Bob Ross is well known for his TV series The Joy of Painting and his distinctive mountain landscape paintings. This how-to book is one of many in a fun series for beginners learning to paint in the style seen on TV. It is a quick technique using washes of wet paint applied directly as a way of layering the image, rather than waiting for each later to dry. An assortment of tools and brushes are then used to style the details in the painting, such as trees, mountains and clouds with special firm oil based paints. The effects are quick and easy to reproduce and designed to encourage newcomers to painting to take pleasure in this fun hobby. 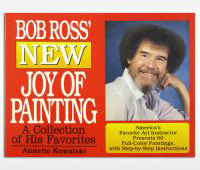 Most people who buy this book will be familiar with Bob Ross' TV show, which is hugely popular worldwide. He had a gentle charismatic manner that appealed to viewers whether they were painters or not, in fact many of the viewers of the show would just watch for the sheer pleasure. Ross wanted to open peoples' eyes to the beauty of the natural world around them, and to use painting as a way of connecting with a sense of peace. Author Annette Kowalski reminds us what Ross often said, that "there is no failure, only learning." The technique has been especially useful in programs for the elderly, handicapped and young people because of its gentle restorative effect. It is a low-key approach that takes away the pressure often associated with learning a new skill, and particularly good for building confidence in a creative skill. Bob Ross New Joy of Painting is not a comprehensive guide to painting in the general sense, rather a learning aid to encourage creativity by using simple steps towards creating a desired image There are no less than 60 full color paintings and step-by-step guides on how to paint them. The print quality is not fantastic and the how-to illustrations are in black and white, which is not always particularly helpful, but you get the general idea. Through trying a few of the projects, there will be similar techniques which you will pick up as you go along. Each guide has a section on the different elements of the picture and how to create them using the specified tools. There is a list at the beginning of each project suggesting the tools you will need and the exact paint colors. This will give the beginner confidence, and later they can start to experiment when they have improved their technique. Each painting is given an evocative title such as The Golden Glow of Morning, Tranquil Dawn and Grey Mountain, which helps you to be inspired. Whether you have enjoyed watching Bob Ross on TV and would like to have a go at making your own easy paintings, or you are a beginner looking for inspiration, this would be a great place to start.